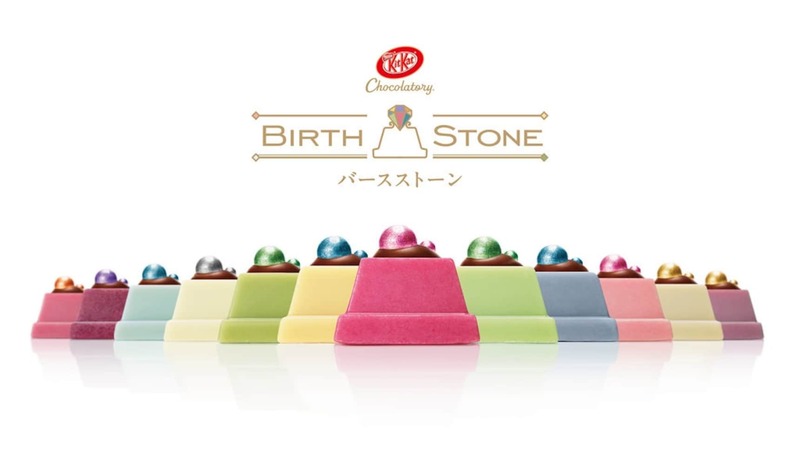 Offered through Kit Kat’s Japanese Chocolatory specialty stores (as well as online from Amazon and Rakuten), the Kit Kat Chocolatory Birthstone series will see a new release each month, starting from November 1, 2017, with each limited-time flavor corresponding to that month’s birthstone. So starting things off is the amber-colored Topaz Kit Kat. While that may look like a gemstone at the tip of the Kit Kat, it’s actually a dragée, the tiny sugar confectionery that’s often used to decorate cakes and other desserts with tiny silver spheres. In addition to a special color, each birthstone Kit Kat (all priced at ¥1,485 [$US13.50] for a pack of three sticks) also has a unique, often seasonally appropriate, flavor, which in the case of November/Topaz is chestnut. Though the remaining flavors won’t be released for some time, let’s take a look at some that are coming up in a couple of months. Coming up in December is beni imo, or purple yam, which captures Tanzanite's lilac luster perfectly. With most babies born in September, which has Sapphire as its birthstone, the blueberry Kit Kat is sure to be a popular choice. And of course, just like there’s no rule that says people can only wear jewelry with their own birthstone, there’s nothing stopping you from eating each and every flavor as the months go by. Check out the other flavors of the month by visiting RocketNews 24 via the link below.